Southsea Beach Cafe along the Esplanade in Portsmouth. Virtually kissing the rolling tides of the city's coastline, Southsea Beach Cafe is exactly what's written on the tin. Inspect its facade on Eastney Esplanade – almost adjacent to Canoe Lake – and it does not appear substantial. But take a walk inside and what you are met with is a Tardis, packed with bright seating and flooded with natural light. It was bustling. Staff looked busy but not out of their depth, diners looked happy, and present among their chatter was the unmistakable (but homely) cafe clang of cups, saucers, plates and cutlery. And with Tuesday lunch service in full swing, I was greeted and seated within 30 seconds – but it was busy, so booking ahead wouldn't go amiss. Pay the cafe a visit sooner rather than later and you'll get the chance to tuck into its new spring menu which, luckily for the Dish Detective, boasts an array of hearty treats for brunch (served from 12.15pm). 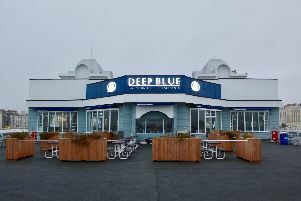 Unsurprisingly, three of its seven main course options hail from the sea – and, in coastal situ, that's where I opted to cast my culinary net. Unsure of portion sizes at this stage, I ordered the carb-heavy crab mac 'n' cheese (£12) with a side of rustic fries (£3) – thank the food gods for my fast metabolism. A fair size for their price tags, I thought, both were delicious and went down a treat. The former tastily comprised macaroni pasta and fresh, local crab in a cheese and shellfish bisque sauce – topped with a parmesan and herb crust. Crusty bread and a mixed leaf salad in a citrus dressing were on the side. Strangely, I was told by my waiter not to expect too cheesy an affair with this dish. But my concerns were quickly quashed when lunch was served – on a wooden board no less. The pasta was soft, sweetly seasoned and stringy – but not stodgy – in consistency. There was plenty of cheese too, to my delight. But of course, what billed the dish as unique was the crab interspersed among its macaroni shells. This was outstanding. However, my only regret is that there was not more of it. I was certainly not left hungry – nor were my taste buds left disappointed – but I felt on the whole this was more of a mac 'n' cheese with crab, than a main course led by it. Between helpings, I snacked on my rustic fries. Ridged, fluffy and perfectly-salted, these are a real winner for those who revel in the modernly adopted trend of skin-on spuds. All-in-all, I devoured my main and its accompaniment – much to the surprise of my waiter, who too noted the combination's carbo-focus. But I had no shame. To wash the pair down I finished with a brownie ice cream thick shake (£4.50). Served in a visibly-frosty steel canister, this sweet treat was most welcome – guilt free too, enjoyed with a paper straw. As a backer of the need to cut down on single-use plastics, the Dish Detective was most impressed. At first I did not deem the shake particularly thick, but when I reached the bottom I was effectively met with a dessert in upon itself. I needed a latte spoon to polish off the remaining shards of brownie, and boy, they were good. With that, I was well and truly full. I left a happy customer. And by the looks of things, so did my fellow diners – who in the form of families, couples, children and even well-behaved dogs – donned many a smile. I was just sad I had no room for one of the cafe's ice creams outside.